A dead whale which washed ashore at Chadchadi mouth of Chilika has been drawing crowd in hordes since Saturday when it was spotted for the first time. More than 30 feet in length, the exact species of the whale is yet to be ascertained. Chilika Divisional Forest Officer Bikash Ranjan Das has requested taxonomist Dr Siba Prasad Parida to carry out an inspection of the dead animal. Parida, who was in Bhitarkanika Wildlife Sanctuary, is on his way to Satapada Forest Range where the whale has been found. In fact, the Chadchadi mouth can be accessed by boat. Das said the carcass was at advanced stage of decomposition which means the whale must have died at least 10 days back. ''Apart from conducting post mortem, Parida will find out if its skeleton can be preserved. Remains of only new and rare species are preserved and it will be for Parida to ascertain the details,'' Das said. 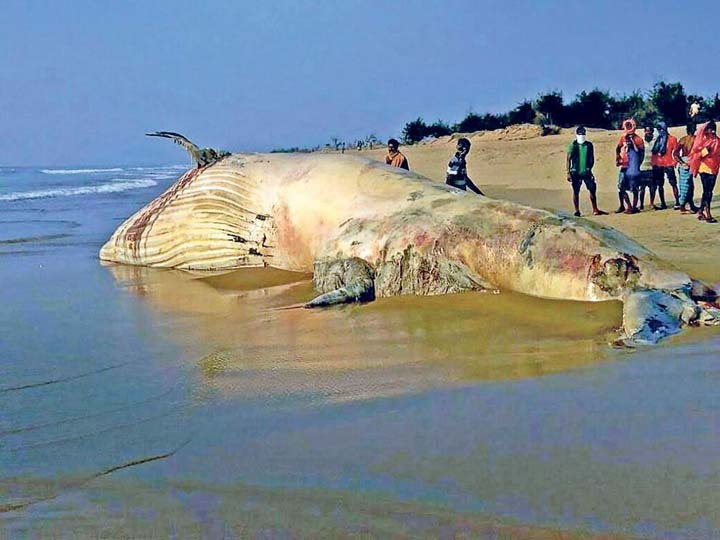 This is not the first time whales have washed ashore at Odisha coast. In December 2014, a 32-feet sperm whale had been spotted at Beleswar beach in Puri district. Parida and his team toiled for nine months to restore the skeleton which is now up at display at Regional Museum of Natural History in the State Capital.